Late evoked responses are generally used for studying higher cortical functions (eg, P300 in Alzheimer disease). Their clinical usefulness is limited by the experimental paradigm, and they are not used routinely or widely in general clinical neurology. Nevertheless, late evoked responses show promise and may make more inroads into clinical settings in the near future. Some centers have developed testing paradigms for olfactory and gustatory evoked responses as well. In some circumstances, MRI and EP studies may be complementary. However, most clinical questions are answered better by MRI of the pertinent neurologic structures. SEPs have shown promise in predicting outcome after postanoxic coma. The visual evoked potential (VEP) tests the function of the visual pathway from the retina to the occipital cortex. It measures the conduction of the visual pathways from the optic nerve, optic chiasm, and optic radiations to the occipital cortex. It is important to keep in mind that although the axons from the nasal half of the retina decussate at the optic chiasm, the temporal axons do not. Therefore, retrochiasmatic lesions may not be detected by full-field checkerboard stimulation. The usual waveform is an initial negative peak (N1 or N75), followed by a large positive peak (P1 or P100), followed by another negative peak (N2 or N145). Maximum value for P100 is 115 msec in patients younger than 60 years; after this age, it rises to 120 msec in women and 125 msec in men. Even though published norms are available in the medical literature, each individual laboratory should have its own norms to control for laboratory-to-laboratory variations in technique. The W morphology, in the author’s experience, is most often an individual variation, though decreasing the stimulation frequency from the ubiquitous 2 Hz to 1 Hz usually converts the W shape into a conventional P100 peak. Check size and alternation rate are factors in this; the responses can be manipulated to a W or a conventional P100 response by changing these parameters. Large checks tend to produce VEPs similar to those produced by flash stimulation. VEPs are most useful for testing optic nerve function and less useful for assessing postchiasmatic disorders. In patients with retrochiasmatic lesions, MRI is a more useful test. Partial-field studies may be useful for retrochiasmatic lesions; however, they are not performed routinely in clinical settings. It is also important to note that the macula projects to the occipital pole, whereas the rest of the retina projects to the mesial calcarine cortex. Although the VEP is very useful for detecting an anterior visual conduction disturbance, it is not specific with regard to etiology. A tumor compressing the optic nerve, an ischemic disturbance, or a demyelinating disease may cause delay in the P100; only additional clinical history and, often, MRI are needed to uncover the etiology. The generator site for VEPs is believed to be the peristriate and striate occipital cortex. Prolongation of P100 latency is the most common abnormality and usually represents an optic nerve dysfunction. VEP is clearly more sensitive than physical examination in detecting optic neuritis. The results from these analyses of VEP indicated topographic localization of the dipoles around the calcarine fissure. This was comparable to the retinotopy of the human occipital lobe based on clinicopathologic studies. In a multicenter study, Brigell et al described the pattern VEP using standardized techniques, concluding that the peak latency of pattern-reversal VEP is a sensitive measure of conduction delay in the optic nerve caused by demyelination. To establish whether pattern-reversal VEP could be standardized for use as a measure in multicenter therapeutic trials for optic neuropathy or multiple sclerosis (MS), the investigators evaluated stimulus and recording variables at 4 centers. Overall, pattern-reversal VEPs were recorded from 64 healthy subjects and 15 patients with resolved optic neuritis; the results showed equivalent latency and amplitude data from all centers, indicating that the VEP test can be standardized satisfactorily for multicenter clinical trials. Furthermore, the authors concluded that the N70 and P100 peak latencies and N70-P100 interocular amplitude difference were sensitive measures of resolved optic neuritis. Abboud et al, in a study that used flash VEP to assess left-right asymmetry in the potential amplitude on the scalp in brain-damaged patients who had sustained a stroke, determined that the VEP amplitude was smaller over the ischemic hemisphere than over the intact hemisphere. This finding indicates that the left-right asymmetry in scalp VEPs of patients after brain damage may be a result of changes in the conductivity of the volume conductor, attributable to the ischemic region between the source and the electrodes. Ipata et al, in a study designed to assess interhemispheric visual transfer of information in humans, obtained estimates of interhemispheric transfer time that ranged from 5.77 to 12.54 msec, depending on the type of component and the location of the electrode sites. More anterior locations yielded shorter values, and overall transfer time tended to be 7 msec shorter for the N70 component than for the P100 component. The usual VEPs are evoked by checkerboard stimulation. Because the cells of the visual cortex are maximally sensitive to movement at the edges, a pattern-shift method is used, with a frequency of 1-2 Hz. The size of the checks affects the amplitude of the waveform and the latency of the P100. In addition, pupillary size, gender, and age all affect the VEP. Deterioration of visual acuity, up to 20/200, does not alter the response significantly; large checks may be required. In some studies, women have slightly shorter P100 latencies. Sedation and anesthesia abolish the VEP. Some subjects, by fixating beyond the plane of stimulation, may alter or suppress P100 altogether. Certain drugs (eg, carbamazepine) prolong VEPs. In a study of the effects of carbamazepine and sodium valproate monotherapy on VEPs in 18 epileptic children, Yuksel et al found that carbamazepine slows down central impulse conduction.  . Pattern-reversal VEPs were determined before administration of the antiepileptic drugs and after 1 year of therapy; the VEP amplitude showed no consistent changes after 1 year of therapy, but VEP P100 latencies were significantly prolonged after 1 year of carbamazepine therapy. A checkerboard pattern (or, less often, a flash) is used as stimulation. Responses are collected over Oz, O1, and O2 and with hemifield studies at T5 and T6 with the standard electroencephalographic (EEG) electrode placement. Monocular stimulation is used to avoid masking of a unilateral conduction abnormality. Sedation should not be used, and note should be taken of medications that the patient is taking regularly. Testing circumstances should be standardized, including a seating distance of 70-100 cm from the monitor screen, which gives a check size of approximately 30 seconds of visual angle. The vision should be corrected to the extent possible in case of a visual problem. Pupil size and any abnormality should be noted. The P100 waveform is at its maximum in the midoccipital area. Stimulus rates of 1-2 Hz are recommended, and the filter setting should be in 1- to 200-Hz bandwidth (the outside limits are 0.2 and 300 Hz). The recommended recording time window (ie, the sweep length) is 250 msec; 50-200 responses are to be averaged. A minimum of 2 trials should be given. The responses are averaged, and the P100 positive polarity waveform that appears in the posterior head region is analyzed. The mean latency is about 100 msec. Normative data should be assembled on a laboratory-by-laboratory basis. A check size of 27 seconds of visual angle may result in normal P100 latency in a patient with cortical blindness; smaller checks (ie, ≤ 20 seconds of visual angle) should be used to demonstrate the abnormality. If cortical blindness is suspected, large checks should not be used. In conditions such as retinal disease or refractory errors, the amplitude may be smaller and, at very small check sizes, the latency may increase. For this reason, proper refraction is of great importance. Because the VEP measures the pathway from the retina to area 17, a normal P100 does not exclude lesions of the visual pathway beyond area 17. Consequently, the VEP may be normal in patients with the diagnosis of cortical blindness. Note that in such cases, the VEP is still useful, in that it rules out disease up to area 17 in patients with a normal response. In general, the VEP is preferable in cases of optic nerve and anterior chiasmatic lesions, whereas MRI is clearly superior in retrochiasmatic disease. Note that the VEP is nonspecific with regard to the underlying etiology and pathology. The VEP characteristically shows an increase in P100 latency of the involved side. The use of steroids in this condition has been controversial. Trauzettel-Klosinski et al observed that oral prednisone initially had a positive effect on VEP latencies in acute optic neuritis. In this study, 48 patients with acute optic neuritis were treated with either oral methylprednisolone (100 mg/day initially with dosage reduction every 3 days; n=15 [treatment group]) or oral thiamine (100 mg/day; n=33 [control group]), 36 of them in a double-blind procedure. Oral methylprednisolone yielded a faster improvement in VEP latency in the initial phase but had no benefit after 12 weeks or 12 months. Elvin et al used Doppler ultrasonography, MRI, and VEP measurements to study abnormal optic nerve function. VEP assessments were performed in 16 patients. Patients with impairment of visual acuity and a prolonged VEP initially had a more swollen nerve and increased flow resistance in the affected optic nerve. Statistically significant side-to-side differences were found in the optic nerve diameter and in the resistance to flow in the central retinal artery between the affected and unaffected eyes. Kesler et al used VEP studies to assess 20 patients with chronic idiopathic intracranial hypertension and found that 55% of the patients had prolonged VEPs. These latencies tended to correlate best with visual field deficits, but other clinical findings were less congruent. The prolongation of the latencies suggested demyelination as the pathogenic process occurring in these individuals. Shibata et al recorded pattern-reversal VEP to transient checkerboard stimulus in 19 patients with migraine with visual aura (ie, classic migraine), 14 patients with migraine without aura (ie, common migraine) in the interictal period, and 43 healthy subjects. Latencies and amplitudes of pattern-reversal VEPs in each group were analyzed. P100 amplitude was significantly higher in patients with classic migraine than in healthy subjects, whereas latencies of pattern-reversal VEPs did not differ significantly. No significant differences were noted in latency between the common migraine group and healthy subjects or in latencies and amplitudes of pattern-reversal VEP between the classic migraine and common migraine groups. These results suggest that patients with classic migraine may have hyperexcitability in the visual pathway during interictal periods and that the increased amplitude of pattern-reversal VEPs after attacks may be due to cortical spreading depression. The brainstem auditory evoked potential (BAEP), or brainstem auditory evoked response (BAER), measures the functioning of the auditory nerve and auditory pathways in the brainstem (see the image below). Normal brainstem auditory evoked potentials. The short-latency BAEP generally is used for clinical purposes. The test can be performed with the patient under either sedation or general anesthesia. Standard broadband monaural click stimulation is used on the ear tested while a masking noise 30-40 dB lower in intensity is used on the contralateral ear. The intensity of the click should be 65-70 dB above the click perception threshold, and clicks should be repeated at a rate of about 10 Hz. BAEPs are useful in estimating or aiding in the assessment of hearing loss. The most commonly used method for this is evoked response audiometry. The frequency of stimulation is 50-70 Hz, and at least 3 different intensities should be used. Wave V latency shifts are used to estimate the amount of hearing loss. In children, especially those younger than 2 years, the BAEP can be used to screen for those in whom auditory amplification might facilitate achievement of more normal speech and language development. However, some children with a normal BAEP have abnormal hearing; Kileny showed middle latency abnormalities in some of these cases. Nevertheless, the role of BAEP is to identify patients who could benefit from a hearing aid. Obviously, with a normal BAEP, a hearing aid would not be useful for correcting the hearing loss. BAEPs predominantly activate the pathways in the brainstem that are ipsilateral to the side of click stimulation. In particular, lesions in the middle to upper pons tend to lead to ipsilateral BAEP abnormalities. The structures involved in the generation of BAEPs may be concerned more with sound localization than with hearing itself. Rarefaction (ie, movement of the earphone diaphragm away from the eardrum) produces an increase in wave I amplitude. In severe hearing loss, all waveforms may be delayed, wave I may be absent with waves II through V delayed, or all waveforms may be absent. Note that in patients with hearing loss, BAEPs still can be obtained to assess central conduction time by increasing stimulation intensity. Kern et al studied the effects of insulin-induced hypoglycemia on the auditory brainstem response (ABR) in humans. ABRs were examined in 30 healthy men during euglycemia and after 20 minutes and 50 minutes of steady-state hypoglycemia of 2.6 mmol/L induced with insulin. Hypoglycemia increased interpeak latencies III-V and I-V, whereas changes in the latency of wave I were not significant. BAEPs are very resistant to alteration by anything other than structural pathology in the brainstem auditory tracts. They are not significantly affected by barbiturate doses sufficient to render the electroencephalogram (EEG) “flat” (ie, isoelectric) or by general anesthesia (though Garcia-Larrea et al reported BAEP loss with combined lidocaine and thiopental infusion  ). Disorders of the peripheral vestibular system do not affect BAEP. Thus, 21 patients who had labyrinthine diseases (ie, Ménière disease, labyrinthitis, vestibular neuronitis) had no BAEP interwave latency abnormalities in terms of the limits employed for clinical neurologic purposes. An electrode is placed on each ear lobe and at Cz. The first 10 msec are averaged; 2000-4000 responses may be averaged. At least 2 separate trials should be performed. The recording montage is at least (and usually) a 2-channel montage: channel 1 is from the ipsilateral ear to the vertex, and channel 2 is from the contralateral ear to the vertex. Because of relative vertex positivity, the waveforms are recorded as upward deflections. The normal response is a series of waveforms within a 10-msec time window. Clinically, the first 5 waves are used, with more significance placed on waves I, III, and V. Peak and interpeak latencies are measured, side-to-side differences are calculated, and wave I-V ratios may be used. Audiometry is very helpful and should be done within a reasonable interval after the BAEP study. This helps delineate any hearing loss that might influence the test results. Hearing loss in the 2000- to 4000-Hz frequency range is especially important in that it may delay the BAEP. Recording a neonatal BAEP is technically different from recording an adult BAEP. The skin of a newborn is very sensitive; accordingly, special nonallergenic tape should be used to fix the electrode, and collodion or other irritant chemicals are to be avoided. To avoid collapse of the earlobe and obstruction of the auditory canal in premature babies, the earphone should be held slightly above the ear. The earphone is best held by hand, and the recording preferably should be performed with the neonate asleep. This helps reduce those high-frequency EEG components that might interfere with BAEP recording. Because of the slower response, the sweep should be set at 15-20 msec and the low-frequency cutoff filter at 20-30 Hz. The most common uses of the BAEP are in multiple sclerosis (MS) and in acoustic neuroma. It is a useful screening test, though it has some limitations; magnetic resonance imaging (MRI) may be preferable when a small lesion is under consideration. Increased I-III interpeak latency indicates a lesion from CN VIII to the superior olivary nucleus, whereas increased III-V interpeak latency suggests a lesion from the superior olivary nucleus to the inferior colliculus ipsilateral to the ear stimulated. Intraoperative monitoring during cerebellopontine angle tumor surgery may be useful in helping the surgeon preserve as much function as possible. 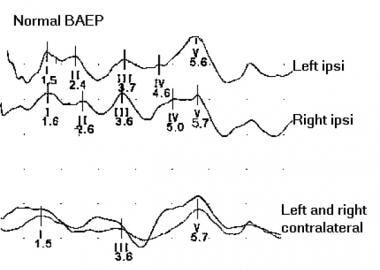 The BAEP may be abnormal when audiometry fails to disclose a lesion. The characteristic findings are increased I-V and increased I-III interpeak latencies ipsilateral to the lesion. Meningiomas and other cerebellopontine angle tumors may not produce any abnormalities until they are large enough to be externally compressive. An abnormal response may be seen with higher frequency in symptomatic patients with demyelinating disease. Sometimes, however, a positive test may be recorded in the absence of clinical brainstem symptoms. BAEP evaluation should be considered if the clinical symptoms implicate a lesion outside the brainstem. In this case, an abnormal BAEP would further support the diagnosis of MS. If, however, the clinical sign (eg, diplopia) points to the brainstem, a BAEP abnormality is merely confirmatory. In various studies, about 20% of the patients tested for a second lesion have an abnormal BAEP, and about half of these go on to develop MS in the next 1-3 years. Chiappa found that the BAEP was positive in 21% of clinically unsuspected cases of MS. Most authors have concluded that of the 3 tests, BAEP yields the smallest percentage of patients; however, it still adds to the detection rate because it is abnormal in a different subset of patients. Bilateral prolongation of latencies and interpeak latencies may be seen. Gordon et al evaluated the efficacy of ABR as a screening test for small acoustic neuromas by assessing the diagnostic sensitivity of BAEP in these tumors. Patients with surgically proven acoustic neuromas underwent preoperative BAEP tests within 2 months of surgery. A result was considered abnormal if the interaural wave I-V latency difference exceeded 0.2 msec, the absolute wave V latency was abnormally prolonged, or waveform morphology was abnormal or absent. Of the 105 patients, 92 (87.6%) had an abnormal BAEP result, and 13 (12.4%) had completely normal waveforms and wave latencies. Of the 18 patients who had tumors larger than 2 cm, 12 had tumors 2.5 cm or larger and 6 had tumors between 2.1 and 2.4 cm; all 18 had abnormal BAEPs. Of the 29 patients with tumors between 1.6 and 2 cm, 25 (86%) had abnormal BAEPs. Of the 45 patients with tumors between 1 and 1.5 cm, 40 (89%) had an abnormal response. Of the 13 with tumors 9 mm or smaller, only 9 (69%) had an abnormal ABR finding. These data show that BAEP sensitivity decreases with decreasing tumor size. Therefore, MRI scanning is the preferred study in this setting because the accuracy for detection of tumors smaller than 1 cm through BAEP testing is 70%. Nevertheless, BAEP studies are useful in patients who have implanted medical devices (eg, pacemakers) that prevent MRI scanning. Taylor et al studied BAEP and VEP in 47 infants with meningomyelocele in an effort to determine whether evoked potentials EPs reflect early neurologic status and whether BAEPs and VEPs have prognostic value for neurologic outcome. The infants, aged 1 day to 3 months, were tested while still in hospital after the meningomyelocele repair. Normal BAEPs were found in 41% of the patients and normal VEPs in 62%. BAEPs were abnormal in 9 infants studied who had symptomatic Arnold-Chiari malformation; VEPs were abnormal in only 55% of symptomatic infants. VEPs did not appear to be sensitive enough to have prognostic value in these infants. Nevertheless, BAEPs were consistently abnormal in patients with symptomatic Arnold-Chiari malformation and showed a positive predictive value of 88% and an accuracy of 84% in predicting central neurologic sequelae. The response to BAEP studies is variable in cases of brainstem stroke; some lesions cause abnormal latencies, and some do not (eg, negative BAEP in lateral medullary syndrome). Schwarz et al showed prolonged interpeak latencies (I-III, I-V, III-V, IV-V) and delayed absolute latencies of waves II, III, V, and I, at least on 1 side, in the BAEP. The auditory pathways are near the respiratory control centers in the brainstem; therefore, the electrophysiologic abnormalities of wave III and the IV-V complex may be a reflection of the disturbed central control of ventilation. BAEP can be done while the patient is sedated. It can be used as a prognostic indicator. Survival is unlikely in the absence of BAEP. The brain-dead patient invariably has abnormal BAEPs—either the absence of all waveforms or the presence of wave I and the absence of all subsequent waveforms. BAEP and SEP studies were performed within 72 hours of admission in 127 children with severe head injury to predict the outcome of posttraumatic coma (brain death or survival). On first assessment, 50 comatose children had normal BAEP and SEP; 78% survived and 22% deteriorated and died. Of the 45 who had abnormal findings; 69% improved and survived, whereas 31% deteriorated and died. All 32 children who did not have recordable BAEP and SEP died. These data suggest that BAER is useful for predicting neurologic outcome in this setting. In a study of 78 children with perinatal asphyxia who were screened with BAEPs, only 37 of the 78 developed neurodevelopmental deficits, consisting of static encephalopathy or developmental delay. BAEP abnormalities were seen in 40.5% of these patients and demonstrated a specificity of 87.8%. With these findings, BAEPs may help predict adverse neurodevelopmental outcomes after perinatal asphyxia. The first evoked potential (EP) measurement is credited to Richard Caton of Liverpool, England, in 1913, but he could not record his results because he had no camera. About 34 years later, the first human scalp recording was accomplished. Major improvements included introduction of the first signal averager (by Dawson in 1954) and of the first modern averager, in 1958. The actual somatosensory EP (SEP) is considered to be the result of summated effects of action potentials and synaptic potentials in a volume conductor. The short-latency SEP (SLSEP) is considered to be generated from volleys traversing the large-fiber sensory system (ie, the posterior columns and medial lemnisci). Studies have shown that simply changing the size and shape of the volume conductor can create voltage differences at the surface. Large-diameter group Ia fibers and group II cutaneous afferents are primarily responsible for SEPs. Because of the ease of delivery and quantification, electrical stimulation is typically used, though other types of sensory stimuli have been tried with success. When a mixed nerve is stimulated, Ia muscle afferents are activated. In the spinal cord, the dorsal columns are mainly responsible for conduction of the activity that generates the SEP. In the brain, the lemniscal and thalamocortical pathways are involved. Extralemniscal pathways also may play a role. Drews et al, in a study investigating the contribution of group I muscle afferent activation to the production of H reflexes and SEP in humans, found that in most subjects, H reflex was correlated with SEP size. If 2 identical stimuli were applied to the posterior tibial nerve with an interval of 1 sec, the second H reflex was 30% smaller than the first one. The corresponding SEPs were reduced only slightly. Postactivation depression presumably results from intrinsic properties of synapses of group I muscle afferents. In this study, electrical stimuli were applied to the tibial nerve in the popliteal fossa to study how the information is transferred from group I muscle afferents to motor neurons and to the somatosensory cortex. For control purposes, identical stimuli were applied to the skin. The SEP evoked by skin stimulation alone had a peak latency that was 5 msec longer than the SEP to transcutaneous nerve stimulation. The threshold intensity to evoke an H reflex was at least twice as high as the threshold for an SEP.
Buchner et al researched the origin of P16 of the median nerve SEP.  After median nerve stimulation, several monophasic peaks were recorded at the scalp in the 15- to 18-msec time range. Source analysis using 3 different methods modeled a source near the center of the head with an orientation toward the activated hemisphere and a peak activity at 16 msec after the stimulus. Magnetic recordings detected no signals in this time range, which confirmed that the source had a subcortical location. From dipole localization, the exact origin of the P16 source could not be assigned to either the subthalamic level or the thalamocortical radiation, because of the limited spatial resolution at the center of the spherical head model. An estimate of the conduction velocity of the medial lemniscus suggested a subthalamic origin. The P16 source was preserved in 2 patients with a lesion of the thalamocortical radiation and the ventral thalamus. Further evidence for a subthalamic location was derived from the physical mechanisms generating far-field potentials. N1 and P1 were correlated significantly with height and limb length. Noguchi et al, in a study that evaluated the changes of frontal and parietal SEP in the awake state and compared them with SEPs in different stages of sleep in 10 healthy adult subjects, found that frontal and parietal SEP components were affected differently as sleep stages progressed. The amplitudes of frontal components were increased in sleep, whereas the amplitudes of parietal components were decreased. The most discordant changes occurred in stages III/IV. The amplitudes for the frontal N18-P22-N30 complex and the parietal N20-P26-N32 complex increased from stage II to stages III/IV, whereas those for frontal N30-P40 and parietal N32-P40 decreased. P14 and frontal N18 latencies did not change significantly. The further latencies showed progressive prolongation from the awake state to slow-wave sleep. The SEP waveforms and latencies in rapid eye movement (REM) sleep were similar to those in the awake state. Amplitudes for frontal peaks remained slightly higher and amplitudes for parietal peaks slightly lower. Apparently both excitatory and inhibitory influences may mediate these sleep stage–related changes. Note that significant neuropathy may be a complicating factor in acquiring SEP, and the development of cortical potentials may be irregular, delayed, dispersed, and of poor amplitude. Generally, some of these difficulties can be overcome by increasing the number of samples collected. Mixed nerve stimulation need not be supramaximal; a small twitch is sufficient. The duration of the stimulus is typically 200-300 msec, though some prefer longer stimuli. The repetition rate is usually 3 Hz, though some patients tolerate only 1-2 Hz. There is no change in SEP until the 15-Hz stimulation frequency and no need for random stimuli (thought they may be needed to trigger off the electrocardiogram [ECG]). Cutaneous nerve stimulation is used with the trigeminal and lateral femoral cutaneous nerves; dermatomal studies may be used to study segmental innervation disturbances. Dermatomal SEPs may be technically difficult and therefore are not used routinely. Current MRI technology has largely replaced dermatomal SEP studies in suspected radiculopathies and spinal cord lesions. In expert hands, however, the latter may have value in selected cases. Surface or needle electrodes may be used. Cephalic bipolar or referential recording montages are appropriate. The general setting for filtering is 10-2500 Hz. Most human clinicopathologic correlations suggest that the N/P13 waveform is generated in the lower medulla, probably in the dorsal column nuclei. The negativity recorded in the Fz-Cc derivation (N19) is the difference in negativity between the 2 electrode sites and thus is a “derived” waveform. N19 generally is believed to originate in the primary sensory cortex; however, good human clinicopathologic data are available to suggest that much of N19 is generated in the thalamus. Chiappa et al and Goldie et al published data on a series of patients with instructive lesions, indicating that much of the negativity after 15 msec was generated in the thalamus. [44, 32] Regli and Despland studied 50 patients who had acute infarctions and found N19 to be preserved in small lesions confined to the postcentral gyrus but absent in large lesions involving the underlying white matter and thalamus. Epileptogenic lesions of the sensory cortex often produce augmentation of P22 but not of N19. These data suggest that the negative deflection appearing 16-19 msec after stimulation of the median nerve at the wrist is probably generated in the thalamus. The widespread negative activity seen at 25-30 msec with lower-limb stimulation (ie, the posterior tibial nerve at the ankle) is also believed to be generated in the thalamus. The subsequent positive activity (N/P37) is probably generated in the primary sensory cortex. When lower-limb stimulation is employed, absence of the cauda equina potential (LP) suggests the presence of a lesion at or below that level. Technical considerations (eg, muscle artifact) also may obscure the LP potential. Clinical interpretation is based on the time interval between wave peaks. Registering a good Erb point or LP potential is important for allowing measurement of central conduction times. Side-to-side comparisons of latencies can be useful in clinical diagnosis. Like BAEPs, SEPs are fairly resistant to changes by widespread influences other than structural pathology in somatosensory tracts. SLSEPs are not significantly altered by barbiturate doses sufficient to render the electroencephalogram (EEG) isoelectric or by general anesthesia. Yiannikas et al found that both SEPs and electromyography (EMG) were of limited clinical utility in patients with cervical spondylosis who presented with symptoms but without neurologic signs of root compression. In patients with clinical signs of neurologic deficit, EMG and SLSEPs may be helpful or confirmatory. In patients with clinical evidence of myelopathy, performing SLSEPs from both upper and lower extremities may be informative and may reveal or disprove a conduction block. Patients with syringomyelia often have abnormal central conduction time after upper-limb stimulation. In cervical spondylosis, an abnormal latency difference may be noted between brachial plexus (EP) and lower medullary (N/P13) components after upper limb stimulation. Le Pera et al documented selective abnormality of the N13 spinal SEP to dermatomal stimulation in patients with cervical monoradiculopathy. Scalp SEPs to dermatomal stimulation have proved to be only partially useful in the diagnosis of monoradiculopathy, mostly in cases without motor impairment. The aim of the study was to test the sensitivity of the spinal N13 potential in uncovering lesions of single cervical roots. The investigators studied 5 patients suffering from cervical monoradiculopathy by using a technique that allowed specific recording of the genuine N13, which probably is generated by dorsal horn cells. None of the patients showed signs of muscle impairment, and needle EMG findings were always normal. In 4 patients, the N13 SEP was absent after stimulation of the dermatome corresponding to the damaged root, whereas both the lemniscal P14 and the cortical N20 components were normal. SEP recorded after stimulation of upper-limb nerves showed no abnormality in any of these patients. Apparently, loss of N13 potential after dermatomal stimulation could be due to deafferentation of dorsal horn neurons; the N13 is particularly sensitive to initial root compression. A montage allowing recording of the genuine N13 SEP, therefore, can improve the sensitivity of dermatomal SEP recording in patients with suspected cervical monoradiculopathies. Eisen et al reported abnormal results in trigeminal nerve stimulation in 41% of patients with MS.  Abnormalities of trigeminal SLSEPs have also been reported in patients who had MS, Wallenberg syndrome, cerebellopontine angle tumors, trigeminal neurinomas, or meningeal sarcoidosis with facial paralysis. Approximately one third of SLSEP abnormalities in MS are unilateral. One fifth of the bilateral abnormalities are asymmetric. Some patients with MS show loss of N/P13 with preservation and normal latency of N19; this pattern is difficult to explain if SLSEP generator sources are assumed to be linked in series. Comparisons of SEP, visual evoked potential (VEP), and brainstem auditory evoked potential (BAEP) have found that VEP testing and SEP testing are about equally sensitive for revealing clinically unsuspected lesions and that BAEP is one half to one third less sensitive. The 3 tests should be viewed as complementary. Sitzoglou et al identified clear dermatomal SEP abnormalities that correlated with radiculopathy in as many as 83% of the cases studied. Electromyography (EMG) yielded positive results in about 63% of the same subjects. Thus, dermatomal SEPs may complement routine electrophysiologic testing of patients with radiculopathy and may provide a sensitive noninvasive technique for defining the level of disk prolapse. This study included 24 patients with unilateral radiculopathy, all of whom had clinical signs and symptoms of disk prolapse and positive findings on neuroradiologic testing. The latency and the amplitude of the first positive SEP waveform were measured, and both peripheral nerve conduction studies and EMG were performed. Tsonidis et al reported on the diagnostic value of dermatomal SEPs by correlating the neurophysiologic data with clinical, neuroradiologic, and operative findings in 12 patients with surgically treated lumbar disk protrusion. The retrospective study disclosed correlation of the SEPs after dermatomal stimulation and surgical findings in 83% of cases. Patients with cervical cord syrinxes may show abnormalities in median nerve SEPs, indicating a lesion in the upper cervical cord, with relative sparing of lower-limb SEPs. Wagner et al monitored median nerve SEPs intraoperatively in 28 patients with cervical or cervicothoracic syringomyelia. Analysis was focused on SEP components: N13 (spinal cord), P14 (brain stem), and N20 (cortex). N13 was absent in about 87% of patients because of a combined effect of syringomyelia and general anesthesia, and it did not recover. P14 showed a significant intraoperative latency increase in 2 patients; this was irreversible in 1 patient who had a postoperative worsening of sensory function. N20 showed no significant alterations. Pure motor deficits after surgery were not predicted by SEP monitoring. In this study, some patients with MRI evidence of cervical cord impingement or intramedullary T2 hyperintensity showed normal SEPs, whereas 8 of 13 patients without evidence of cord narrowing or T2 signal abnormality showed abnormal SEPs. This discrepancy suggests that MRI and SEPs may evaluate different aspects of the disease process. On the basis of this study, the SEP does not appear to be a good measure of anatomic deficit; however, spinal cord dysfunction detected by SEP may be present in patients with an unremarkable MRI image. SEP recording may therefore be useful in the preoperative assessment of symptomatic patients without MRI evidence of cervical cord compression. Lyczak et al reported abnormal SEPs in 56% of patients with cervical myelopathy. The tibial nerve SEPs were used, and abnormal central conduction times were observed. A significant reduction of the abnormalities occurred after the operation. Abnormal SEPs before the procedure correlated with the severity of myelopathy, and improvement in SEPs after the procedure correlated strongly with clinical improvement. The basis of intraoperative SEP as a representative index of motor function is based on the fact that the vascular compromise that may cause motor dysfunction or loss also affects the lateral corticospinal tract and the dorsal spinocerebellar tract. In general terms, the regions of both motor and sensory pathways (lateral corticospinal tract and dorsolateral spinal cord and the alpha motor neurons) are served by the same vascular supply. Intraoperative SEP poses a special challenge and requires close cooperation with the operating room staff, as well as special equipment and careful attention to limit electrical noise. Careful checking of the ground is important, as is good shielding. The list of interfering factors is long and includes electrocautery equipment, nerve stimulators, and electric drills. Anesthetic agents and level of anesthesia also are interfering factors. Stimulus pulse duration was evaluated by Luk et al, who found a duration of 0.3 msec to be the recommended choice for tibial SEPs during intraoperative monitoring. Stimulus duration affected amplitude but not latency. In this study, no postoperative neurologic abnormalities were seen when SEP and MEP parameters remained stable. In 20 of the 85 cases, the MEP was abnormal, with or without SEP changes. In 7 of these cases, the MEP recovered, and there were no resulting neurologic deficits. The remaining 13 patients did not have recovery of the MEP and had transient or permanent neurologic abnormalities. Four patients had SEP changes with no MEP abnormalities that did not correlate to postoperative motor dysfunction. In this study, epidural spinal cord EPs were recorded in 95 patients undergoing surgery for cervical or thoracic compressive myelopathy. Abnormal spinal cord EPs correlated significantly with the severity of spinal cord compromise and symptoms (eg, myelopathy). All of the thoracic myelopathy cases and 91% of the cervical myelopathy cases exhibited abnormal EPs. Davis et al reported the use of ulnar nerve SEPs to detect and prevent position-related neuropathy in the first pediatric patient in the world to undergo robotic-assisted thyroidectomy; they concluded that upper-extremity SEPs should be routinely performed during this procedure. Patient positioning for this approach, as well as retraction during exposure, has the potential to result in postoperative brachial plexopathy similar to what is seen in other types of surgery. Rowed et al used SEP to identify the somatosensory cortex in an effort to help remove intracranial neoplasms and spare eloquent cortex. SEPs were recorded in response to contralateral median nerve stimulation from the cortical surface. Polarity reversal of SLSEP waves was used to identify the position of the central sulcus in 46 consecutive craniotomies for removal of metastases, gliomas, or meningiomas located in, near, or overlying sensorimotor cortex. SEP is used in the context of diabetes mainly for purposes of confirmation, though it can also be used in selected cases when the central conduction time is needed. In general, the SEP is prolonged in patients with clinically significant diabetic neuropathy. Although SEP may be confirmatory, it is not used often, since routine nerve conduction studies readily yield the diagnosis in diabetic neuropathy. Palma et al studied SEPs in individuals with non–insulin-dependent diabetes who had different degrees of neuropathy. The wrist–Erb point conduction velocity is decreased and the Erb point–N13 interpeak latencies are increased in patients with diabetes. The N11-N13, N13-N20, and N13-P22 interpeak latencies are within the normal range. The wrist–Erb point conduction velocity was proportional to the degree of neuropathy. The degrees of neuropathy have no influence on the EP-N13 interpeak latency. Giant SEPs have been reported in cortical reflex myoclonus. Kofler et al described enlarged cortical responses in 14 patients with progressive supranuclear palsy (PSP), attributing this finding to cortical hyperexcitability. Given that frontal lobe dementia is frequently present in patients with PSP, striatofrontal deafferentation and intracortical disinhibition may explain the increase in the size of the SEP.
Ferri et al observed large-amplitude middle latency SEPs in children with benign epilepsy of childhood with centrotemporal spikes. The mechanism of this is not known. An age-related decrease in amplitude and a lack of SEP after age 12 years were noted. The findings may be interpreted as maturational changes. Rinsho described a 66-year-old woman with corticobasal degeneration, cortical reflex myoclonus with related cortical spike, aphasia, clumsiness, and dystonia with rigidity. The right side was affected, and median nerve stimulation elicited a giant SEP over the left scalp. He also described a 58-year-old woman with reflex myoclonus cortical myoclonic tremor and a giant cortical SEP. In a study of 2 patients with corticobasal degeneration, 1 showed a giant SEP and 1 did not. Valeriani studied cortical myoclonus and concluded that the initial giant SEP corresponded to physiologic potentials evoked in healthy subjects, whereas the late giant SEP could be explained by the hyperpolarization that follows the postsynaptic excitation of the early components. Ugawa reported that the dipole responsible for the giant SEP is localized in the sensory cortex. Some patients showed the localization for the dipole in the superior frontal gyrus in the paracentral lobule. In a study by Schmitt et al, increased amplitude of SEP was noted in all cases of ceroid lipofuscinosis. Myoclonus and giant SEP have been described in herpes simplex encephalitis. Triggs described giant SEP with anterior spinal artery syndrome. The hypothesis has been advanced that this is due to lack of inhibition of the anterolateral inhibitory influences on the dorsal column medial lemniscal system. Saitoh described giant SEP in the syndrome of mitochondrial myopathy, encephalopathy, lactic acidosis, and strokelike episodes (ie, MELAS syndrome). Lu reported dyssynergia cerebellaris myoclonica in 3 brothers in whom alcohol decreased both the myoclonus and the giant SEP amplitude. Guerit et al studied the use of the SEP to determine the optimal degree of hypothermia during circulatory arrest and found that the delay of SEP reappearance after restoration of blood flow correlated significantly with cardiac arrest duration. They concluded that neurophysiologic monitoring of brainstem activity, as provided by SEPs, enables determination of the optimal temperature for hypothermic circulatory arrest. Neurologic recovery was uneventful in 23 patients; 5 patients presented with neurologic sequelae (minor or transient in 4; no recovery from anesthesia and death after 48 hours in 1), and 4 patients died during the operation. Of the 24 surviving patients in whom P14 disappeared when the hypothermia was deep enough to cause cardiac arrest (duration, 17-94 min), 23 had a normal neurologic outcome. By contrast, all surviving patients in whom cortical SEPs disappeared at higher temperatures presented neurological sequelae. Duffy et al compared the results of cerebral oximetry and SEP monitoring in carotid endarterectomy. A 50% decrease in SEP amplitude and a 10% decrease in regional oxygen saturation (rSO2) were considered clinically significant. Compared with SEP, rSO2 had a sensitivity of 50% and a specificity of 96%. Clinical experience with this evolving technology is ongoing. Its role in neurovascular procedures has yet to be established. Fiori and Parenti used 2-channel electroencephalography (EEG) and SEP monitoring for selective shunting during 255 carotid endarterectomies for severe carotid stenosis; they found that computerized EEG is an easily interpretable method of monitoring and reveals rapidly developing cerebral ischemia but that severe SEP changes can occur in spite of a normal EEG pattern when cerebral ischemia has a slow onset. SEP monitoring is a slower recording method of but can yield a finer distinction of less severe cerebral ischemia. Patients with myotonic dystrophy have a prolonged interpeak latency between the Erb point and N/P13, indicating a sensory system involvement in this disorder. The existence of differential sensory block during epidural analgesia has been confirmed by some authors and disputed by others. Zaric et al evaluated epidural sensory block by thermal stimulation, laser stimulation, and recording of the SEP and found that recording of SEP did not demonstrate significant difference between responses from the sites with the most superficial sensory block and those from the sites with the most intense sensory block. In this study, the zone of anesthesia was smaller than the zone of any other investigated variable. The cranial spread of analgesia and motor block was lower than that of laser-assessed block. Partial block of laser perception and thermal perception lasted longer than analgesia and motor block. No consistent segmental or temporal differences were found between the thermal test and laser methods. During epidural block, prolongation of latencies and reduction in amplitudes of SEP produced at the most cranial analgesic dermatome did not differ significantly from those produced at the anesthetic dermatome. No differential block of small nerve fibers was found during epidural analgesia by thermal test and argon laser stimulation. Zandbergen et al found SLSEP and neuron-specific enolase (NSE) to be correlated with unfavorable outcomes. Patients who were unconscious at 72 hours and had an abnormal SLSEP had poor outcomes. Even after 24 hours, the predictive value of the SLSEP was very strong. Myelination occurs earlier in the peripheral nerves than in the central pathways. Consequently, changes are noted in SEPs seen as children mature. These changes are seen in the latency and morphology of waveforms. As with peripheral nerve conduction studies, the conduction velocities are decreased and do not reach adult values until age 3-4 years for peroneal nerve stimulation. With respect to the SEP waveforms, the mean Erb point latency will not change with maturation. Central conduction times are increased in infants and decrease as individuals mature. The morphology is comparable to that of cortical waveforms, which are broader in the young and decrease with age. During the last decade, the rapid advancement in magnetic resonance imaging (MRI) technology has diminished the utilization of electrophysiologic testing. To an extent, this is justified by the high yield and generally good correlation of MRI findings with the underlying pathology. In addition, MRI is often better able to visualize the pathologic anatomy underlying a disease state. Nevertheless, there are some situations in which either the disturbance is not readily visible by an imaging modality or MRI is neither feasible nor cost-effective. For such eventualities, evoked potential (EP) studies—including visual evoked potential (VEP), brainstem auditory evoked potential (BAEP), and somatosensory evoked potential (SEP)—are uniquely suited. Their current clinical role may be briefly summarized as follows. In a wide variety of primary and secondary visual system diseases, VEP testing provides a sensitive extension of the clinical examination. MRI is a highly accurate localizing modality, whereas VEP is useful primarily in assessing optic nerve function in the anterior (prechiasmatic) portion (it is lateralizing but not localizing to the lesion). In patients with insidious onset and appropriate MRI findings for multiple sclerosis (MS), VEPs are recommended to help confirm the diagnosis. BAEP is useful in acoustic neuroma, but in the past few years its yield in small lesions has been surpassed by that of MRI, and in most cases MRI is clearly superior. However, MRI may be inapplicable in some patients (eg, the increasingly large percentage of elderly persons who are equipped with pacemakers), whereas BAEP studies can be done in patients with a variety of implanted devices. BAEP provides good anatomic definition. SEP, though limited with respect to spatial localization, is a good functional tool; its primary use is to determine compromised central nervous system (CNS) conduction. It may help confirm symptoms when few physical findings are noted. It may also reveal asymptomatic lesions, thereby facilitating the workup of suspected MS. SEP testing and MRI may serve as complementary modalities. SEP is of limited value in spinal disorders. Degenerative disk disease, spinal stenosis, and compressive lesions show poor physioanatomic correlation. SEP may confirm or reject the presence of a suspected conduction block. BAEPs and short-latency SEPs (SLSEPs) may be able to establish an anatomic region where the conduction disturbance or block occurs. They provide a sensitive tool for assessment of brainstem auditory and somatosensory tracts and nearby structures. Abnormalities demonstrated by these tests are etiologically nonspecific and must be integrated carefully into the clinical situation by a physician familiar with the clinical uses and limitations of these tests. In patients who have experienced a cardiac arrest, MRI of the brain frequently is unremarkable for pathology and therefore is less helpful in predicting neurologic outcomes from the injury. In these situations, SEP studies may be useful for helping predict negative outcomes. With advances in technology and increases in the frequency with which certain implants and medical devices are used in patients, the number of people who are unable to undergo MRI scanning is growing. For these patients, EP studies may be a suitable avenue for diagnosis. Finally, intraoperative EPs may provide timely information in the operating room that has the potential to improve neurosurgical or neurovascular surgical outcomes. What are evoked potentials (EPs)? What are the differences in the clinical use between MRI and evoked potentials (EPs)? What are visual evoked potential (VEP) tests? What is the physiologic basis of visual evoked potential (VEP)? Which factors influence results of visual evoked potentials (VEPs)? What are the technical aspects of visual evoked potentials (VEPs) for clinical use? What are pitfalls in the use of visual evoked potentials (VEPs) for clinical use? Which disorders may be identified with visual evoked potentials (VEPs)? Which factors contribute to the clinical usefulness of visual evoked potential (VEP) testing? What is the role of visual evoked potential (VEP) testing in the workup of optic neuritis and neuropathy? What is the role of visual evoked potential (VEP) testing in the workup of multiple sclerosis? What is the role of visual evoked potential (VEP) testing in the workup of adrenoleukodystrophy? What is the role of visual evoked potential (VEP) testing in the workup of idiopathic intracranial hypertension? What is the role of visual evoked potential (VEP) testing in the workup of migraine? What are brainstem auditory evoked potential (BAEP) tests? What is the physiologic basis of auditory evoked potentials (BAEPs)? Which factors contribute to the clinical usefulness of brainstem auditory evoked potentials (BAEPs)? What are technical aspects of brainstem auditory evoked potential (BAEP) testing? What are most common uses of the brainstem auditory evoked potential (BAEP) testing? What is the role of brainstem auditory evoked potential (BAEP) testing in the workup of cerebellopontine angle lesions (acoustic neuromas)? What is the role of brainstem auditory evoked potential (BAEP) testing in the workup of demyelinating disease? What is the role of brainstem auditory evoked potential (BAEP) testing in the workup of migraine? What is the role of brainstem auditory evoked potential (BAEP) testing in the workup of multiple sclerosis? What is the role of brainstem auditory evoked potential (BAEP) testing in the workup of brainstem tumor? What is the role of brainstem auditory evoked potential (BAEP) testing in the workup of meningomyelocele? What is the role of brainstem auditory evoked potential (BAEP) testing in the workup of brainstem stroke? What is the role of brainstem auditory evoked potential (BAEP) testing in the workup of respiratory insufficiency after encephalitis? What is the role of brainstem auditory evoked potential (BAEP) testing in determining prognosis of coma? What is the role of brainstem auditory evoked potential (BAEP) testing in determining prognosis of perinatal asphyxia? What is the role of brainstem auditory evoked potential (BAEP) testing in the workup of childhood speech disorders? What is the role of brainstem auditory evoked potential (BAEP) testing in the workup of dementia? What are somatosensory evoked potential (SEP) tests? What is the physiologic basis of somatosensory evoked potentials (SEPs)? What are the generators of median nerve somatosensory evoked potential (SEP)? What are generators of tibial somatosensory evoked potential (SEP)? How do age, height and limb length affect the results of somatosensory evoked potentials (SEPs) after median nerve stimulation? How does sleep stage affect the results of somatosensory evoked potentials (SEPs) testing? How does water immersion affect the results of somatosensory evoked potential (SEP) testing? Which stimulation techniques are used in somatosensory evoked potential (SEP) testing? How are somatosensory evoked potentials (SEPs) recorded and filtered? Which channels are used in normal upper-limb (median nerve) short-latency somatosensory evoked potential (SEP) testing? What is the role of (N/P13) deflection in somatosensory evoked potential (SEP) testing? What is the role of somatosensory evoked potentials (SEPs) in the workup of multiple sclerosis? What is the role of somatosensory evoked potentials (SEPs) in the workup of lumbosacral disk disease? What is the role of somatosensory evoked potentials (SEPs) in the workup of cervical syringomyelia? What is the role of somatosensory evoked potentials (SEPs) in the workup of spondylosis? What is the role of somatosensory evoked potentials (SEPs) in the workup of L5/S1 radiculopathy? What are intraoperative somatosensory evoked potentials (SEPs)? What is the role of somatosensory evoked potentials (SEPs) in the workup of acute transverse myelitis? What is the role of somatosensory evoked potentials (SEPs) in the workup of tuberculous myelopathy? What is the role of somatosensory evoked potentials (SEPs) in the workup of intracranial neoplasm? What is the role of somatosensory evoked potentials (SEPs) in the workup of diabetic polyneuropathy? What is the role of somatosensory evoked potentials (SEPs) in the workup of neurologic conditions? What is the role of somatosensory evoked potentials (SEPs) in the workup of vitamin B-12 deficiency? What is the role of somatosensory evoked potentials (SEPs) in the workup of hyperthyroidism? What is the role of somatosensory evoked potentials (SEPs) in the workup of hypothermia? What is the role of somatosensory evoked potentials (SEPs) in carotid endarterectomy monitoring? What is the role of somatosensory evoked potentials (SEPs) in the workup of myotonic dystrophy? What is the role of somatosensory evoked potentials (SEPs) in the workup of epidural sensory block? What is the role of somatosensory evoked potentials (SEPs) in determining the prognosis of postanoxic coma? What is the role of somatosensory evoked potentials (SEPs) in determining the prognosis following cardiac arrest? What is the role of somatosensory evoked potentials (SEPs) in determining the prognosis following a stroke? How does normal aging affect the results of somatosensory evoked potential (SEP) testing in children? What is the clinical role of evoked potentials? Ikeda H, Nishijo H, Miyamoto K, et al. Generators of visual evoked potentials investigated by dipole tracing in the human occipital cortex. Neuroscience. 1998 Jun. 84(3):723-39. [Medline]. Brigell M, Kaufman DI, Bobak P, et al. The pattern visual evoked potential. A multicenter study using standardized techniques. Doc Ophthalmol. 1994. 86(1):65-79. [Medline]. Abboud S, Bar L, Rosenfeld M, Ring H, Glass I. Left-right asymmetry of visual evoked potentials in brain-damaged patients: a mathematical model and experimental results. Ann Biomed Eng. 1996 Jan-Feb. 24(1):75-86. [Medline]. Ipata A, Girelli M, Miniussi C, et al. Interhemispheric transfer of visual information in humans: the role of different callosal channels. Arch Ital Biol. 1997 Mar. 135(2):169-82. [Medline]. Yuksel A, Sarslan O, Devranoglu K. Effect of valproate and carbamazepine on visual evoked potentials in epileptic children. Acta Paediatr Jpn. 1995 Jun. 37(3):358-61. [Medline]. Trip SA, Schlottmann PG, Jones SJ. Optic nerve atrophy and retinal nerve fibre layer thinning following optic neuritis: Evidence that axonal loss is a substrate of MRI-detected atrophy. Neuroimage. 2006 Jan 26. [Medline]. Sannita WG, Fatone M, Garbarino S, et al. Effects of physiological changes of serum glucose on the pattern-VEP of healthy volunteers. Physiol Behav. 1995 Nov. 58(5):1021-6. [Medline]. Baumgartner J, Epstein CM. Voluntary alteration of visual evoked potential. Ann Neurol. 1982. 12:476. Horn FK, Michelson G, Schnitzler E. Visual evoked potentials of the blue-sensitive pathway under cold provocation in normals and glaucomas. J Glaucoma. 2006 Feb. 15(1):17-22. [Medline]. Parisi V, Miglior S, Manni G. Clinical ability of pattern electroretinograms and visual evoked potentials in detecting visual dysfunction in ocular hypertension and glaucoma. Ophthalmology. 2006 Feb. 113(2):216-28. [Medline]. Szabela DA, Loba J, Palenga-Pydyn D. [The picture of visual evoked potentials in type 2 diabetes mellitus]. Klin Oczna. 2005. 107(7-9):498-501. [Medline]. Halatek T, Sinczuk-Walczak H, Rydzynski K. Prognostic significance of low serum levels of Clara cell phospholipid-binding protein in occupational aluminium neurotoxicity. J Inorg Biochem. 2005 Sep. 99(9):1904-11. [Medline]. Halatek T, Sinczuk-Walczak H, Szymczak M. Neurological and respiratory symptoms in shipyard welders exposed to manganese. Int J Occup Med Environ Health. 2005. 18(3):265-74. [Medline]. Thurtell MJ, Bala E, Yaniglos SS, Rucker JC, Peachey NS, Leigh RJ. Evaluation of optic neuropathy in multiple sclerosis using low-contrast visual evoked potentials. Neurology. 2009 Dec 1. 73(22):1849-57. [Medline]. [Full Text]. Trauzettel-Klosinski S, Diener HC, Dietz K, et al. The effect of oral prednisolone on visual evoked potential latencies in acute optic neuritis monitored in a prospective, randomized, controlled study. Doc Ophthalmol. 1995-96. 91(2):165-79. [Medline]. Elvin A, Andersson T, Soderstrom M. Optic neuritis. Doppler ultrasonography compared with MR and correlated with visual evoked potential assessments. Acta Radiol. 1998 May. 39(3):243-8. [Medline]. Atilla H, Tekeli O, Ornek K. Pattern electroretinography and visual evoked potentials in optic nerve diseases. J Clin Neurosci. 2006 Jan. 13(1):55-9. [Medline]. Yukagawa E, Urano T, Nakahara M. Pattern-reversal Visual Evoked Potentials in Patients with Human T-lymphotropic Virus Type 1 Uveitis. Curr Eye Res. 2006. 31(1):37-42. [Medline]. Polman CH, Reingold SC, Edan G, Filippi M, Hartung HP, Kappos L, et al. Diagnostic criteria for multiple sclerosis: 2005 revisions to the "McDonald Criteria". Ann Neurol. 2005 Dec. 58(6):840-6. [Medline]. Kaplan PW, Tusa RJ, Shankroff J, et al. Visual evoked potentials in adrenoleukodystrophy: a trial with glycerol trioleate and Lorenzo oil. Ann Neurol. 1993 Aug. 34(2):169-74. [Medline]. Kesler A, Vakhapova V, Korczyn AD, Drory VE. Visual evoked potentials in idiopathic intracranial hypertension. Clin Neurol Neurosurg. 2009 Jun. 111(5):433-6. [Medline]. Shibata K, Osawa M, Iwata M. Pattern reversal visual evoked potentials in classic and common migraine. J Neurol Sci. 1997 Feb 12. 145(2):177-81. [Medline]. Zgorzalewicz M. [Visual evoked potentials in children and school adolescents with migraine and tension-type headache. Clinical and neurophysiological correlations]. Neurol Neurochir Pol. 2005. 39(4 Suppl 1):S26-35. [Medline]. Kileny P. Auditory evoked middle latency responses: current issues. Semin Hear. 1983. 4:403. Kern W, Kerner W, Pietrowsky R, et al. Effects of insulin and hypoglycemia on the auditory brain stem response in humans. J Neurophysiol. 1994 Aug. 72(2):678-83. [Medline]. Garcia-Larrea L, Artru F, Bertrand O, et al. Transient drug-induced abolition of BAEPs in coma. Neurology. 1988 Sep. 38(9):1487-9. [Medline]. Zgorzalewicz M. [The study of early auditory evoked potentials in primary headaches in children and adolescents and their pathogenetic implications]. Neurol Neurochir Pol. 2005. 39(4 Suppl 1):S17-25. [Medline]. Purves SJ, Low MD, Galloway J. A comparison of visual, brainstem auditory, and somatosensory evoked potentials in multiple sclerosis. Can J Neurol Sci. 1981 Feb. 8(1):15-9. [Medline]. Ferrer S, Jimenez P, Mellado L, Thieck E. [Clinical correlations and evoked potentials in 29 cases of definitive multiple sclerosis]. Rev Med Chil. 1993 Oct. 121(10):1154-60. [Medline]. Kjaer M. Evoked potentials in the diagnosis of multiple sclerosis. Electroencephalogr Clin Neurophysiol Suppl. 1987. 39:291-6. [Medline]. Kjaer M. Brain stem auditory and visual evoked potentials in multiple sclerosis. Acta Neurol Scand. 1980 Jul. 62(1):14-9. [Medline]. Chiappa KH. Pattern shift visual, brainstem auditory, and short-latency somatosensory evoked potentials in multiple sclerosis. Neurology. 1980 Jul. 30(7 Pt 2):110-23. [Medline]. Taylor MJ, Boor R, Keenan NK, et al. Brainstem auditory and visual evoked potentials in infants with myelomeningocele. Brain Dev. 1996 Mar-Apr. 18(2):99-104. [Medline]. Schwarz G, Litscher G, Rumpl E, et al. Brainstem auditory evoked potentials in respiratory insufficiency following encephalitis. Int J Neurosci. 1996 Feb. 84(1-4):35-44. [Medline]. Jiang ZD, Liu XY, Shi BP, Lin L, Bu CF, Wilkinson AR. Brainstem auditory outcomes and correlation with neurodevelopment after perinatal asphyxia. Pediatr Neurol. 2008 Sep. 39(3):189-95. [Medline]. Maassen B, Pasman J, Nijland L. Clinical use of AEVP- and AERP-measures in childhood speech disorders. Clin Linguist Phon. 2006 Apr-May. 20(2-3):125-34. [Medline]. Nuwer M. Assessment of digital EEG, quantitative EEG, and EEG brain mapping: report of the American Academy of Neurology and the American Clinical Neurophysiology Society. Neurology. 1997 Jul. 49(1):277-92. [Medline]. Drews H, Gerilovsky L, Studer LM, et al. Contribution of a Ia muscle afferent activation to the rise of H reflexes and somatosensory evoked potentials in man. Somatosens Mot Res. 1998. 15(2):109-17. [Medline]. Buchner H, Waberski TD, Fuchs M, et al. Origin of P16 median nerve SEP component identified by dipole source analysis--subthalamic or within the thalamo-cortical radiation?. Exp Brain Res. 1995. 104(3):511-8. [Medline]. Vaney N, Gupta S, Aggarwal S, et al. Median nerve somatosensory evoked potentials correlation with physical parameters. Indian J Physiol Pharmacol. 1996 Apr. 40(2):175-9. [Medline]. Noguchi Y, Yamada T, Yeh M. Dissociated changes of frontal and parietal somatosensory evoked potentials in sleep. Neurology. 1995 Jan. 45(1):154-60. [Medline]. Sato D, Yamashiro K, Onishi H, Shimoyama Y, Yoshida T, Maruyama A. The effect of water immersion on short-latency somatosensory evoked potentials in human. BMC Neurosci. 2012 Jan 24. 13(1):13. [Medline]. Goldie WD, Chiappa KH, Young RR, et al. Brainstem auditory and short-latency somatosensory evoked responses in brain death. Neurology. 1981 Mar. 31(3):248-56. [Medline]. Regli F, Despland PA. Usefulness of short-latency SEPs in 50 cases with cerebrovascular lesions. Presented at 34th Annual Meeting, American Academy of Neurology, Washington DC. April 25-May 1. 1982. Yiannikas C, Shahani BT, Young RR. Short-latency somatosensory-evoked potentials from radial, median, ulnar, and peroneal nerve stimulation in the assessment of cervical spondylosis. Comparison with conventional electromyography. Arch Neurol. 1986 Dec. 43(12):1264-71. [Medline]. Le Pera D, Valeriani M, Tonali P, et al. Selective abnormality of the N13 spinal SEP to dermatomal stimulation in patients with cervical monoradiculopathy. Neurophysiol Clin. 1998 Jun. 28(3):221-9. [Medline]. [Guideline] Gronseth GS, Ashman EJ. Practice parameter: the usefulness of evoked potentials in identifying clinically silent lesions in patients with suspected multiple sclerosis (an evidence-based review): Report of the Quality Standards Subcommittee of the American Academy of Neurology. Neurology. 2000 May 9. 54(9):1720-5. [Medline]. Eisen A, Purves S, Hoirch M. Central nervous system amplification: its potential in the diagnosis of early multiple sclerosis. Neurology. 1982 Apr. 32(4):359-64. [Medline]. Sitzoglou K, Fotiou F, Tsiptsios I, et al. Dermatomal SEPs--a complementary study in evaluating patients with lumbosacral disc prolapse. Int J Psychophysiol. 1997 Apr. 25(3):221-6. [Medline]. Tsonidis C, Tsitsopoulos P, Sitzoglou K, et al. Comparison of dermatomal SEPs and operative findings in lumbar disc disease. Int J Psychophysiol. 1996 Dec. 24(3):267-70. [Medline]. Wagner W, Perneczky A, Maurer JC. Intraoperative monitoring of median nerve somatosensory evoked potentials in cervical syringomyelia: analysis of 28 cases. Minim Invasive Neurosurg. 1995 Mar. 38(1):27-31. [Medline]. Berthier E, Turjman F, Mauguiere F. Diagnostic utility of somatosensory evoked potentials (SEPs) in presurgical assessment of cervical spondylotic myelopathy. Neurophysiol Clin. 1996. 26(5):300-10. [Medline]. Lyczak P, Zabielski W. [Correlations between clinical course and investigation results of central conduction time of somatosensory potentials evoked from tibial nerves in patients with cervical myelopathy treated by surgery]. Pol Merkuriusz Lek. 2005 Aug. 19(110):162-5. [Medline]. Dumitru D, Dreyfuss P. Dermatomal/segmental somatosensory evoked potential evaluation of L5/S1 unilateral/unilevel radiculopathies. Muscle Nerve. 1996 Apr. 19(4):442-9. [Medline]. Castello PH, Place HM, Hemler DE, et al. Quantification of lumbar nerve root decompression using somatosensory-evoked potentials. J Spinal Disord. 1995 Dec. 8(6):444-50. [Medline]. Luk KD, Hu Y, Lu WW. Effect of stimulus pulse duration on intraoperative somatosensory evoked potential (SEP) monitoring. J Spinal Disord. 2001 Jun. 14(3):247-51. [Medline]. Weiss DS. Spinal cord and nerve root monitoring during surgical treatment of lumbar stenosis. Clin Orthop. 2001 Mar. (384):82-100. [Medline]. Shinzawa M, Yoshitani K, Minatoya K, Irie T, Ogino H, Ohnishi Y. Changes of motor evoked potentials during descending thoracic and thoracoabdominal aortic surgery with deep hypothermic circulatory arrest. J Anesth. 2011 Dec 27. [Medline]. Polo A, Tercedor A, Paniagua-Soto J. [Neurophysiological monitoring during scoliosis surgery using controlled hypotension]. Rev Esp Anestesiol Reanim. 2000 Oct. 47(8):367-70. [Medline]. Weigang E, Hartert M, Siegenthaler MP. Neurophysiological monitoring during thoracoabdominal aortic endovascular stent graft implantation. Eur J Cardiothorac Surg. 2006 Mar. 29(3):392-6. [Medline]. Arrington ED, Hochschild DP, Steinagle TJ. Monitoring of somatosensory and motor evoked potentials during open reduction and internal fixation of pelvis and acetabular fractures. Orthopedics. 2000 Oct. 23(10):1081-3. [Medline]. Schwartz DM, Drummond DS, Hahn M. Prevention of positional brachial plexopathy during surgical correction of scoliosis. J Spinal Disord. 2000 Apr. 13(2):178-82. [Medline]. Deutsch H, Arginteanu M, Manhart K, et al. Somatosensory evoked potential monitoring in anterior thoracic vertebrectomy. J Neurosurg. 2000 Apr. 92(2 Suppl):155-61. [Medline]. Hyun SJ, Rhim SC, Kang JK, Hong SH, Park BR. Combined motor- and somatosensory-evoked potential monitoring for spine and spinal cord surgery: correlation of clinical and neurophysiological data in 85 consecutive procedures. Spinal Cord. 2009 Aug. 47(8):616-22. [Medline]. Baba H, Maezawa Y, Imura S, et al. Spinal cord evoked potential monitoring for cervical and thoracic compressive myelopathy. Paraplegia. 1996 Feb. 34(2):100-6. [Medline]. Davis SF, Abdel Khalek M, Giles J, Fox C, Lirette L, Kandil E. Detection and prevention of impending brachial plexus injury secondary to arm positioning using ulnar nerve somatosensory evoked potentials during transaxillary approach for thyroid lobectomy. Am J Electroneurodiagnostic Technol. 2011 Dec. 51(4):274-9. [Medline]. Misra UK, Kalita J, Kumar S. A clinical, MRI and neurophysiological study of acute transverse myelitis. J Neurol Sci. 1996 Jun. 138(1-2):150-6. [Medline]. Misra UK, Kalita J. Somatosensory and motor evoked potential changes in patients with Pott''s paraplegia. Spinal Cord. 1996 May. 34(5):272-6. [Medline]. Rowed DW, Houlden DA, Basavakumar DG. Somatosensory evoked potential identification of sensorimotor cortex in removal of intracranial neoplasms. Can J Neurol Sci. 1997 May. 24(2):116-20. [Medline]. Palma V, Serra LL, Armentano V, et al. Somatosensory evoked potentials in non-insulin-dependent diabetics with different degrees of neuropathy. Diabetes Res Clin Pract. 1994 Sep. 25(2):91-6. [Medline]. Kofler M, Muller J, Reggiani L. Somatosensory evoked potentials in progressive supranuclear palsy. J Neurol Sci. 2000 Oct 1. 179(S 1-2):85-91. [Medline]. Striano P, Madia F, Minetti C. Electroclinical and genetic findings in a family with cortical tremor, myoclonus, and epilepsy. Epilepsia. 2005 Dec. 46(12):1993-5. [Medline]. Tsuda H, Katsumi Y, Nakamura M. [Cerebral blood flow and metabolism in Lafora disease]. Rinsho Shinkeigaku. 1995 Feb. 35(2):175-9. [Medline]. Puri V, Chaudhry N, Goel S. Vitamin B12 deficiency: a clinical and electrophysiological profile. Electromyogr Clin Neurophysiol. 2005 Jul-Aug. 45(5):273-84. [Medline]. Takahashi K, Fujitani Y. Somatosensory and visual evoked potentials in hyperthyroidism. Electroencephalogr Clin Neurophysiol. 1970 Dec. 29(6):551-6. [Medline]. Guerit JM, Verhelst R, Rubay J, et al. The use of somatosensory evoked potentials to determine the optimal degree of hypothermia during circulatory arrest. J Card Surg. 1994 Sep. 9(5):596-603. [Medline]. Duffy CM, Manninen PH, Chan A, et al. Comparison of cerebral oximeter and evoked potential monitoring in carotid endarterectomy. Can J Anaesth. 1997 Oct. 44(10):1077-81. [Medline]. Zaric D, Hallgren S, Leissner L, et al. Evaluation of epidural sensory block by thermal stimulation, laser stimulation, and recording of somatosensory evoked potentials. Reg Anesth. 1996 Mar-Apr. 21(2):124-38. [Medline]. Zandbergen EG, Hijdra A, Koelman JH. Prediction of poor outcome within the first 3 days of postanoxic coma. Neurology. 2006. 66(1):62-68. [Medline]. Wijdicks EF, Hijdra A, Young GB, Bassetti CL, Wiebe S. Practice parameter: prediction of outcome in comatose survivors after cardiopulmonary resuscitation (an evidence-based review): report of the Quality Standards Subcommittee of the American Academy of Neurology. Neurology. 2006 Jul 25. 67(2):203-10. [Medline]. Tzvetanov P, Rousseff RT. Predictive value of median-SSEP in early phase of stroke: a comparison in supratentorial infarction and hemorrhage. Clin Neurol Neurosurg. 2005 Oct. 107(6):475-81. [Medline]. Chiappa KH. Evoked Potentials in Clinical Medicine. 2nd ed. New York: Raven Press. 1990. 37-171, 196-197.